Serve with a dollop of sour cream and additional salsa. Heat oven to 325°F. 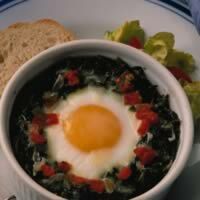 Divide spinach evenly among four, greased 6-oz ramekins or custard cups. Press an indentation (about 2-inch diameter) into center of spinach with back of spoon. Place on baking sheet. Break and slip an egg into each indentation. Top evenly with salsa, then cheese. Bake in 325°F oven until whites are completely set and yolks begin to thicken but are not hard, 20 to 25 minutes.